Never be without the right knife for the job at hand. This professional chef set makes easy work of food preparation and gives you the results you want effortlessly. Carving meats, slicing bread, chopping and dicing vegetables, peeling potatoes, slicing or paring fruits -- all easy tasks when you have the right tool. 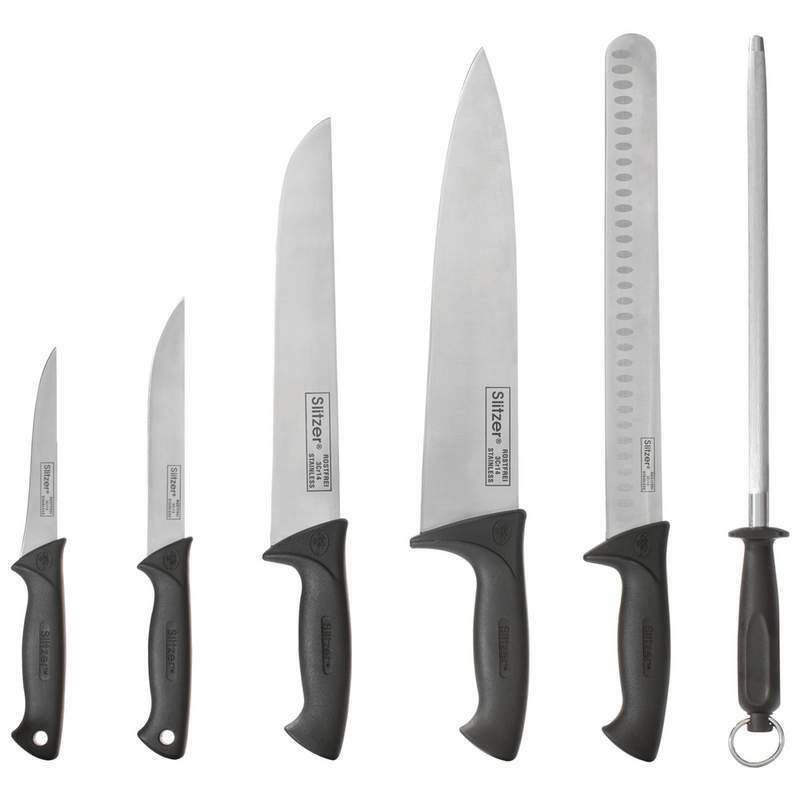 Each knife features a stainless steel blade, bolsters that provide balance while protecting your hand and a fully riveted phenolic handle for maximum comfort. Royal Crest 6 PC Cutlery Set. 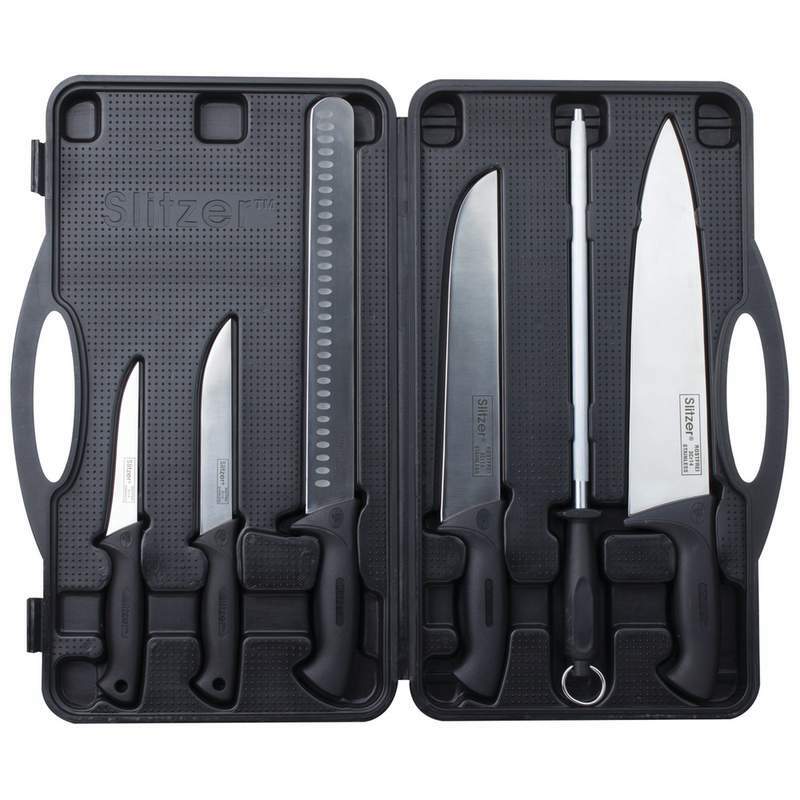 Comes with an 8" Chef Knife, 8" Carving Knife, 8" Bread Knife, 4.5" Ut..
Diamond Cut 19 PC Cutlery Set in Color Magnetic Closure BoxFeaturesYou can always count on durable q..
Diamond Cut 19 PC Cutlery Set in White/Red Bow BoxFeaturesThe Diamond Cut 19 PC Cutlery Set in a gor..
5 PC Hollow Handle Stainless Steel Kitchen Cutlery Set Slitzer 5 PC Hollow Handle Stainless Ste..
Slitzer 10 PC Professional Surgical Stainless Steel Cutlery SetSuperb stainless steel construction w.. Chef's Secret 8 PC 8-1/2" Steak Knife SetFor the busy woman or man who crams 30 hours into a 24-hour..